Factor: Numbers which are multiplied together to get another number is called factors of that number. e.g. 3 and 4 are factors of 12, because 3 × 4 = 12. A number can have many factors. Common factors: Factors that are common to two or more numbers are called common factors. Step 1: Express each number as a product of prime factors. 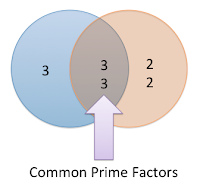 Step 2: HCF is the product of all common prime factors using the least power of each common prime factor. Find the HCF of 108, 288 and 360. Step 3: Divisor of step 2 is divided by its remainder. Continue this process till we get 0 as the remainder. Step 4: Divisor of the last step is the HCF. e.g. Find the HCF of 108 and 288. Step 1: Find out HCF of any two numbers. Note: The Number that divides each of the two numbers also divide their sum, their difference and the sum and difference of any multiples of that numbers. Make the decimal place same in all the given numbers, find the HCF as they are integers, and adjust decimal accordingly in the final result. e.g Find the HCF of 16.5, 0.45 and 15.
now find the HCF of 1650, 45 and 1500, which is 15. The HCF of two or more fractions is the highest fraction which is exactly divisible by each of the fractions. Multiple: Multiple is the product of any quantity and an integer. Common Multiple: Common multiple is that which is multiple of two or more numbers. The common multiples of 2 and 3 are 0, 6,12,18, 24, etc. Step 1: Write the given numbers in a horizontal line separated by commas. Step 2: Divide the given numbers by the smallest prime number which can exactly divide at least two of the given numbers. Step 3: Write the quotients and undivided numbers in a line below the first. Step 4: Repeat the process until we reach a stage where no prime factor is common to any two numbers in the row. 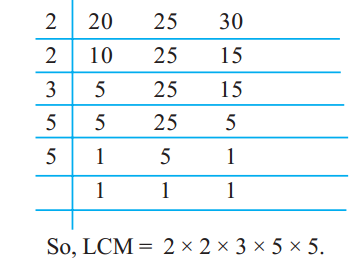 Step 5: LCM is the product of all the divisors and the numbers in the last line. e.g. Find the LCM of 20, 25 and 30 by long division method. Make the decimal place same in all the given numbers, find the LCM as they are integers and adjust decimal accordingly in the final result. now find the LCM of 60, 960 and 36, which is 2880. The LCM of two or more fractions is the least fraction or integer which is exactly divisible by each of them. HCF of numbers always divides LCM exactly.